TElders auctioneer Will Soddart sold these Merino wethers for $180 in the hot mutton market at Wagga Wagga yesterday. 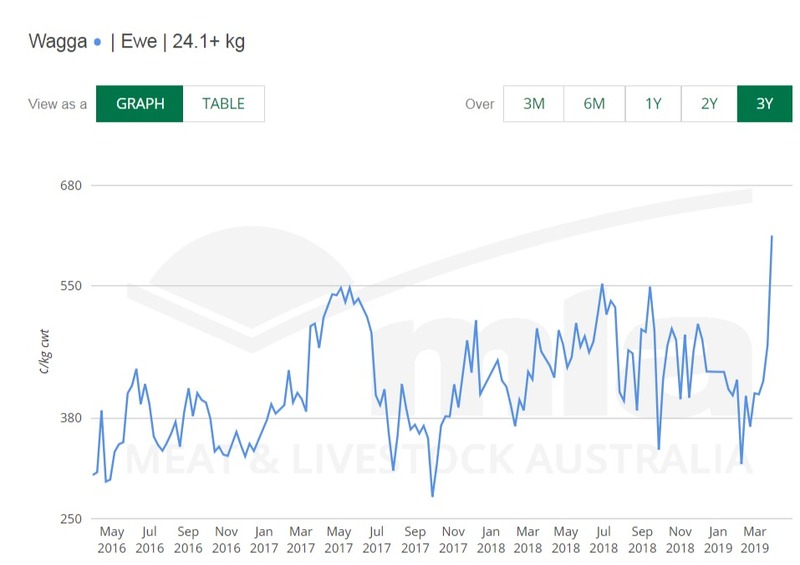 MUTTON sheep prices hit new heights at Wagga Wagga in New South Wales yesterday as tighter quality supply, export contract demands and competition pushed rates over 660c/kg cwt at times and up to $234 a head for crossbred ewes. 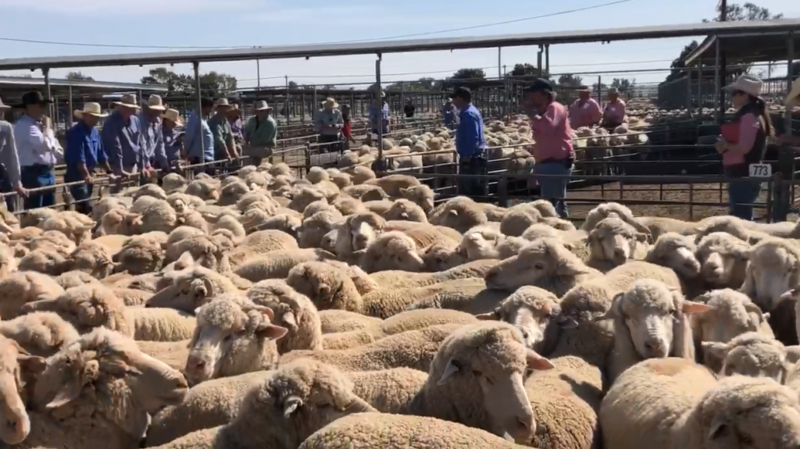 The National Livestock Reporting Service confirmed that the mutton prices at Wagga Wagga were the highest for ewes ever recorded at the centre. The National Livestock Reporting Service said three major buyers dominated the market, pushing mutton prices above 600c/kg cwt. Heavy crossbred ewes sold $51 dearer, making from $160 to $234/head to average 599c/kg cwt, the NLRS said. Heavy Merino wethers sold to $227, though some carried fleeces valued at up to $45. The NLRS said trade sheep were well-supplied, with prices generally $28 dearer at $102-$165 and averaging 550c/kg cwt. Agents seem divided on whether the dramatic lift in mutton prices would be sustained next week, although it has given those still carrying ewes or Merino wethers attractive options to carrying stock on in the difficult season. Fletcher International and Thomas Foods International were reportedly strongest on the heavier crossbred sheep, with Junee active on 26kg Merino wethers, while other mutton buyers during the sale pulled out of bidding on some lines, saying prices were 200c/kg above their limits. Agents confirmed several heavy ewe lines made $220-$230 ewes, with many just $10 less than heavy lambs, and some producers at Wagga sold ewes for more per head than their lambs. Wagga’s heavy lambs 24-26kg gained $14 to average 676c/kg cwt. Most extra heavy lambs 26kg plus sold up to $12 dearer at $179 to $247.20, the NLRS said. Prices for recently shorn lambs generally lifted $10-$20to $135-$176, and most heavy trade lambs 22-24kg made from $158-$177. Light and medium trade weights averaged 684-697c/kg cwt. Restockers paid $61-$140 for store lambs. Wagga agents yarded 7000 sheep, 3550 fewer than last week, and the impact of rain and supply led to major mutton processors bidding to extreme levels on ewes over 18kg cwt. Elders auctioneer Joe Wilks said the mutton market was “on fire” with a very good lineup, with big wethers and crossbred ewes yarded. Mr Wilks said rain was a factor in the centre’s lower sheep numbers, although not all areas had received rain recently. Mr Wilks confirmed that some clients sold ewes for more than their lambs. “Whatever way you want to look at it, they (ewes) were making as much as their lambs nearly. “One score Merino ewes that were making $45-$50 were making $80 and big barren crossbred ewes sold pretty well last week at $155-$160 were making $205-$208. Mr Wilks said Thursday’s sale was “one out of the box” and next week’s prices will be the test. Elders agent Bryan Maher said one of his clients sold the cast for age and dry first cross ewes carrying six month’s wool for the top price of $234. He was expecting the ewes to make $165-$170. After 50 years as a stock agent, he can’t recall a higher price for mutton sheep. “We’ve shot as good a sheep in the past. Delta Agribusiness agent Scott Hall said one of his clients sold first cross ewes for $187 and their Poll Dorset lambs for $190 and $173 on Thursday. One of Delta’s clients has been selling dry Dohne ewes over the past three weeks, with the first heaviest lot making $150, followed by $155 in the second week and $176.20 on Thursday. Landmark Wagga livestock manager Peter Cabot said the mutton prices on Thursday were probably as high as he had ever seen as numbers dwindled. Landmark sold ewes to $225 and lambs for up to $247. “The rain has helped, but we said six weeks ago, ‘rain or not there are going to be none left’. “It was very dear, that’s as big a rise as I’ve seen in one go for probably ever,” he said. H Francis and Co agent Alex Croker said one of the buyers commented that the mutton prices and competition had increased because buyers needed to fill a current contract. Wagga agent Mark Logan said although the quality of Wagga’s sheep yarding was good, he expected the higher mutton prices to continue with fewer sheep available and all the processors with orders. GJ Hulm and Co agent Isaac Hill said the “unreal” mutton prices had spurred him onto to market a big line of export weight Merino wethers for a client for $200-plus direct to a processor. The wethers would otherwise have been sold in June after shearing. “I’m concerned that eventually we are going to end up with a supply crunch in which case they (the processors) will start dropping off shifts in the winter. “They’ve got very good feed at the moment and we’ve just done some sums, we can actually put weaners on that feed for 6-8 weeks and we can grow them out better so they for the next four years shear an extra kilogram a year because they are a better structured sheep,” he said. At the Cowra saleyards in NSW today, the NLRS said medium Merino ewes were $30 dearer and averaged $125 or 540c/kg cwt. Heavy first cross ewes sold for up to $182 and were up to $51 dearer, averaging $180 or 580c/kg cwt. Mutton prices also followed the week’s dearer trend at Griffith today, where rates lifted $20-$30. Merino ewes sold from $113-$190 and crossbred ewes made $110-$210, with Dorper ewes making from $103-$150.